Just as music went from vinyl to streaming, registration for music programs has moved online. But the tedious process of collecting and sorting data can still feel like listening to a broken record. 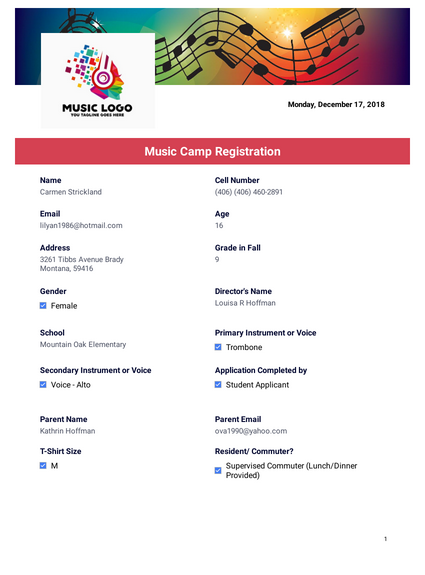 Unless you have JotForm’s Music Camp Registration PDF Template — an essential instrument for any camp coordinator providing summer programs to aspiring musicians. You can convert submitted registration forms into personalized PDFs that are easy to share with students and their guardians. This template provides customizable form fields for standard contact information, scholarship and payment details, and all that jazz. You can easily modify the bells and whistles by rearranging form elements, changing the headers and color scheme, and adding your camp logo. With your students’ information organized and beautifully displayed in PDFs that you can pull up any time on any device, even in the middle of practice, data management will sound more like music to your ears. If you are recieving a local scholarship (band boosters, women's club, etc.) list it below.